Gong doesn't play that many concerts anymore, but when they do, they know how to do it right! Many months in advance they had announced the Gong Family Unconvention, to be held in the Melkweg in Amsterdam, in two halls three days of music by around twenty-five different bands. You'll find a list of all bands and musicians on the official planetgong website. I live about 40 kilometers from Amsterdam. I had doubted for a long time about it. After all, it was 140 euros... But now, looking back on it, I can't remember why I ever doubted it. I knew it had been a good choice from the very moment Daevid Allen entered the stage for the first time. I had never seen any of the musicians before in my life. I only had two very short videos of Gong in the nineties. The Melkweg is not very big. The large hall is called the Max, there's a smaller hall called the Old Hall, and there's a pub-restaurant. In the hall in the midst of it is the cloak-room and there were stands with T-shirts, cd's and books. There were different albums every day, and I only saw the books on the third day. The T-shirts however were not very beautiful, all but one were monochrome white on a single colour background. Programme of the Gong Family Unconvention in Amsterdam, 3, 4 and 5 November 2006 (click to download an 829 KB big version). It all started in the large hall, where Daevid Allen sat on a chair centre-stage. He had been busy for some time on stage, adjusting his equipment, like he was just another roadie. 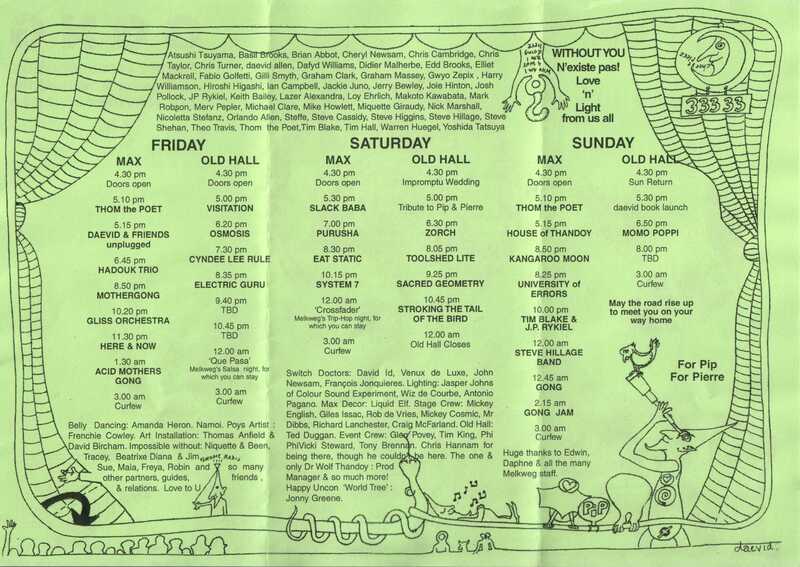 The first concert was announced as Daevid Allen & friends unplugged. They played Allen solo songs, Allen on electric guitar and Graham Clark, a fantastic violin-player. They started with a love song, a sing-along for the audience, in which Allen expressed his gratitude to the crowd. It was a canon (but it was not sung like that), and the words were "Dear friends, dear friends / Let me tell you how I feel / You have given me so much pleasure / I love you so." After a few songs also Mike Howlett entered the stage, with his very old and somewhat threadbare but oh so beautiful bass... what a musician! And then also Gilli Smyth entered the stage, cord in hand, with which I guess she did the echoes and other voice-effects. And all the time there was a respectful but enthousiastic audience, and lots of space to dance or to walk up to the first row and back again. But I think I am not going to try and describe this first concert... It was so magical, it really is beyond any description. It was for sure one of the five best concerts I've ever seen, and these one and a half hours alone were well worth the price of admission! 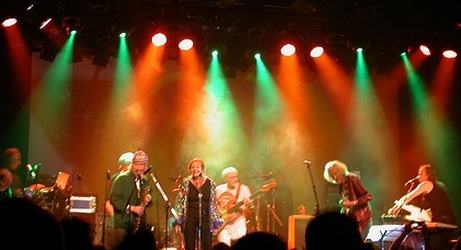 Daevid Allen in Amsterdam, 3 November 2006 (unknown photographer). That same evening we also saw Mother Gong, with another bassist, but with Didier Malherbe for the first time on stage, and with Orlando Allen on drums (Daevid's son). Gilli Smyth looks quite old (I've been told she's even older than Daevid Allen) but was apparently enjoying herself and happy with a full hall of interested people. Many of the people in the audience were quite young, in their twenties (although there were of course also a lot of aged hippies). We wanted to spare ourselves, so we missed out on Here & Now and Acid Mothers Gong. I remember this day we only saw small parts of performances in the Old Hall, where a turntable-keyboard-laptop was set up, which was accompagnied by different soloists (on voice or other musical instruments). On Saturday we were in time to witness the 'impromptu wedding' that was held in the Old Hall. It appeared that Gilli Smyth as master of the ceremony was going to wed Rick Chafen to his wife Kathy. Smyth told the audience about how the two had met, and a little about the importance of Chafen for the breakthrough of Gong and many other bands to a wider audience in America, and then asked Rick and Kathy to repeat their wedding vows after her. All the time, I mean all three days, at all concerts and in the hall there were members of Gong and other musicians walking around, listening to the music, getting photographed and questioned and talking to everyone, or just looking busy with who-knows-what. During the wedding-ceremony Daevid Allen was in the audience, and a little later he took to the stage to lead the tribute to Pip Pyle and Pierre Moerlen, who both had died recently. In rememberance of Pierre Moerlen Daevid Allen told about him and then led the crowd through the Melkweg, walking in front, carrying a picture of Moerlen. After having returned in the Old Hall Pip Pyle was remembered. A number of people told hilarious stories about his wild character, and Steve Hillage came on stage to explain how he would never have been a member of Gong if it hadn't been for Pip Pyle. After this Daevid Allen started to pass around drums and drumsticks and anything that would make noise. For about half an hour the Old Hall was busy drumming, dancing and making a racket in rememberance of Pip Pyle. After this we went to the Max, but weren't impressed by Slack Baba (or maybe we were too late, I don't remember). But on returning to the Old Hall we bumped into a beautiful concert by something called Toolshed Lite, which had this fabulous violinist Graham Clark again and if I remember correctly also Daevid Allen on guitar. I was a bit surprised. Allen had started the weekend by playing his guitar sitting on a chair (during the first concert), so I had thought he was getting a bit older and tired and that he would not appear today in order to save his energy for Sunday. But he was full of energy, playing the guitar, dancing, laughing, and having a lot of fun. During breaks we walked to the Max two or three times to see what Eat Static was, but it was trance or whatever you'd call it, some variant of house-music. We were not impressed, but all the more by the performances in the Old Hall. 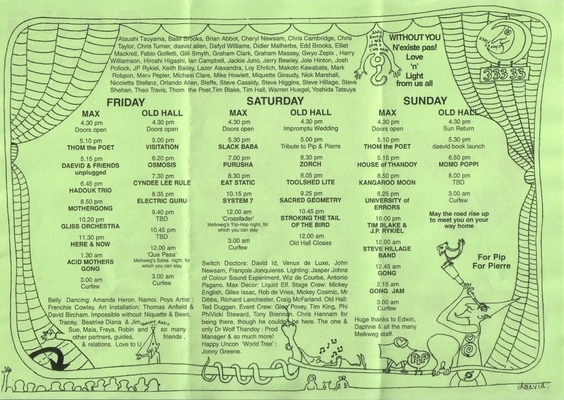 We missed all of System 7, but maybe we just didn't recognize it as being System 7... Sacred Geometry meanwhile was a project by Daevid Allen and Gilli Smyth and I think also Mike Howlett, some spacey, long-spun tunes to try and get the audience to levitate. I was so rapt that I forgot to pay attention, but I'm sure some people in the audience levitated! After that there was a project with the unusual name Stroking The Tail Of The Bird, a project by Allen and Smyth with Malherbe if I remember correctly, psychedelic music with space whispers by Smyth and a tale told by Allen. We didn't stay for the trip-hop night and left before one o'clock. Every now and then there were people burning incense and once I saw someone passing sticks around, lighting them for people who wanted to hold one. Of course a lot of grass was smoked, but still not as much as I had expected. And there was this guy who was almost constantly busy blowing bubbles (you know, little soap-bubbles, but not by blowing through a round hole on a stick, but by using a small plastic machine). By appearance he reminded us a bit of a gnome, actually! On Sunday we arrived a little later in Amsterdam, too late for the book signing by Daevid Allen. It appeared to be the first part of his biography, which was a thick and quite expensive book, so we decided not to buy it (who knows how many parts haven't been released yet...?). Written by himself, called Gong Dreaming 1, and available through SAF and Firefly publishing. But we did buy a smaller book with poems by Daevid Allen, called Poet For Sale. And an album by the University Of Errors, and a live album by Mother Gong. There was also a limited edition series of 20 cd's with live recordings by Daevid Allen and different guests... oh, so tempting, but 15 euros a piece, and... where to start? We also missed Kangaroo Moon this night, but were right on time for the University Of Errors. This project by Daevid Allen has just released the album Jet-Propelled Photographs, with remakes of the famous old Soft Machine songs from the time Daevid Allen was still in Soft Machine (like Save Yourself, I Should've Known, Love Makes Sweet Music, Soon Soon Soon, etc). We were very surprised to get treated to a concert with those old Soft Machine songs, loud, raucous, and with erronous and chaotic long solos, something like the way the old Soft Machine used to perform these songs (around 1967, that is). Personally I expected to see Robert Wyatt appear on stage at any given moment during the show, and one person in the audience shouted out: "Where's Kevin Ayers then?" They played two or three Gong songs (one of which was Stoned Innocent Frankenstein) and about eight or ten Soft Machine songs. What a party! After this there was a concert by Tim Blake and J.P. Rykiel. I had never heard of them, and I won't bore you with a description other than: music for three keyboards and one exaggerated new agey person (Blake). We left after only a few seconds, embarressed. But in moments like this the restaurant and the Old Hall were very nice to relax in...! And so the time had come for the Steve Hillage Band, that was announced as the first time they would perform since 1977. They started early, around 11:30 or 11:45. It was Steve Hillage on guitar, Chris Taylor on drums, Mike Howlett on bass (who was enormous again!) and Miquette Giraudy on keyboards. They were very well received by the audience. I thought they were good, especially Howlett, but it's not quite my music I think. Without a pause after 45 minutes or an hour or so Daevid Allen entered the stage, followed by Didier Malherbe, Gilli Smyth and others (Tim Blake) and the Gong set began, with Hillage and unchanged rhythm-section. I've no idea anymore what they played. They played it all. Every one of all songs on Magick Brother, Flying Teapot, Angel's Egg, You, everything...! You name them, they played them! It was a giant party, with much more people in the audience than the days before. They played loud, full of fun, filling all of the stage, with eight and later even ten people there at the same time. And they kept on playing. They just seemed to never stop. After they had played all (ah well, almost all) of the classic Gong songs, they jammed away on songs from the Gongmaison period, with no less fun than when they had started. Allen changed clothes about three times but was almost all the time on stage, from 12:30, and Steve Hillage, Mike Howlett and Chris Taylor had even been playing since 11:30, without a break. 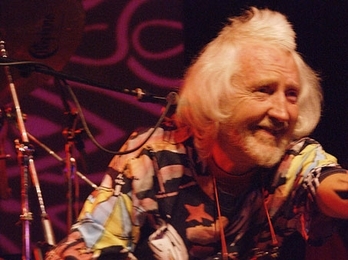 The last of Daevid Allen's costumes was a long glitter-blue robe with a blue pointed hat, and the robe was held together by a badge with the Peter Hammill-monogram. It was only a few hours after Hammill's birthday... but Rick Chafen told me he had given Allen that badge. At almost three they played their last song, but then came back, and Allen said: "We've ten more minutes left, and we want to use every minute we can get, so... here we go!" And they did an encore until ten minutes past three. The last words Daevid Allen said to the audience were: "Thank you, my darlings!" I was exhausted, so how tired could they have been...? Judging by the fun they had doing it, I'd say they'll return next year. For a ten days unconvention if circumstances permit them! As far as I'm concerned, they may unconvene at any time! Gong in Amsterdam, 5 November 2006 (unknown photographer).